Denmark’s Gregers Christensen set a big goal in 2014. 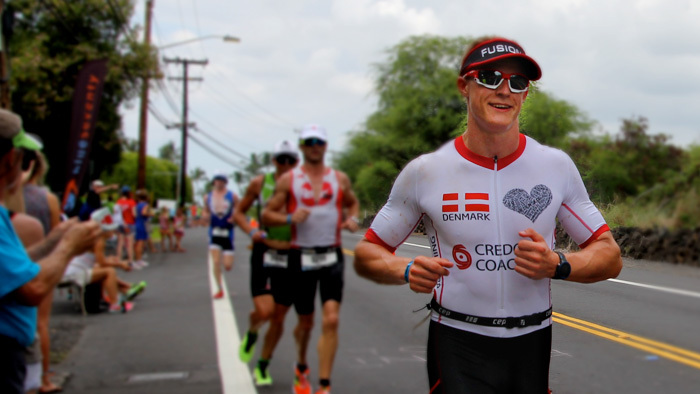 After finishing 8th in the 25-29 age group at the IRONMAN World Championships last year, he wanted to take the top spot. In addition to having to work hard to reach his peak, Christensen has many factors going against him when it comes to racing on the Big Island. At 6 feet tall and 170 pounds, his large frame makes it difficult to handle the heat of Kona. Plus, living in Denmark means that he rarely trains in hot and humid conditions. His race day did not go as planned, still Christensen was able to run a 2:57 marathon, the second fastest age group run split on the day, placing him fifth in the 25-29 age group. Here is a look at how he prepared and how his day unfolded. During the 2014 season, Christensen took a different approach to his training. “I have been focusing a lot on speed and strength (i.e. intervals, high intensity brick sessions and hill reps) and not so much on volume this year,” said Christensen. “I’ve found that in order to simulate those last 10 to 15 km of the marathon in training I need to go very fast instead of long. So instead of doing a long brick session with a 15 to 20 km run at the end I would rather do 8 – 10km just above threshold.” He applied that same philosophy to his long runs. “This year I have skipped the long (27 – 30km) slow runs and replaced them with shorter (18 – 24km) and much faster runs (typically just above HIM pace).” These runs were done on hilly courses to simulate the Kona run course. Christensen trains by pace on the run rather than heart rate. Despite coming out of the water five minutes slower than he had in his two previous years in Kona, Christensen did not panic. What did worry him was his stomach. “I could not keep any fluids in me for the first 2 hours of the ride. Everything I tried to get down got up – including breakfast! I have never experienced stomach issues in an Ironman, this was my 9th, so this was all new to me,” remembers Christensen. His initial plan was to hold 255 to 260 watts in the early part of the bike. However, with his nutrition plan scrapped, he moved to Plan B. From previous physiology testing, he knew his body was efficient at burning fat around 230 to 240 watts so he stayed there. In looking at his power file, he averaged 237 watts for the first two hours. In that time, he burned 1704 calories, none of which were replaced. Finally his stomach settled and Christensen immediately began to get in as many fluids and salt in as he could. Smartly, he resisted the urge to push the bike to make up time. “As I was far behind in my energy strategy I didn’t change much in power on the way home from Hawi,” he said. The final three hours were at an average of 227 watts. His final bike time was 5:01:38. In looking at his power file, his Intensity Factor® (IF®) was .70. This means that he held 70 percent of the power he could sustain over one hour. This is a key as it shows that Christensen did not push himself too hard. The top professionals are able to hold .78 to .82 and still run well. Top age groupers typically should ride at .75 or under. What this shows is tha See Christensen’s power file here. Having previously run under 3 hours for the marathon at IRONMAN Frankfurt on two occasions, Christensen set out on his best leg to run his way onto the podium. “On the run my plan was to start out “slow” (4.15min/km) and then try to push a bit more (4:05 – 4:10min/km) once I reached the Queen K and then go all out with 3 km left,” said Christensen. He felt strong early on and settled into his pre-race plan of 4:15 min/km, or 6:50 min/mile. Soon however, the heat and humidity caught up to him. “My energy was good but I was badly overheating, so I focused on getting as much ice in my suit as possible and lots of cold sponges,” said Christensen. “This helped a lot and I made the decision to run between aid stations and walk through them to keep my core temperature down.” In his run file, you can easily see each aid station he walks as the pace slows to around a 10 min/mile pace. See Christensen’s run file here. After 16k (10 miles), Christensen was on the Queen K Highway. The wind was blowing off the ocean, which helped Christensen keep his temperature down and allowed him to run through some aid stations. At the 25k (16 mile) mark, Christensen made the left turn to head into the Natural Energy Lab, one of the toughest parts of the course. Rather than be discouraged, it was a point that gave him inspiration to push harder. “In Energy Lab I got to see the people in front of me and I could tell that not everybody was feeling the same excitement about the fact that we still had 12k (7 miles) left,” he said. During this 5k (3 mile) stretch into and back out of the NEL, Christensen’s pace remains steady at 4:18 min/km, or 6:55 min/mile. With 3k (1.8 miles) to go, that excitement turned into an all out attempt to get on the podium when Christensen’s girlfriend told him was fighting for 5th place. “I pushed all I could from there on,” recalled Christensen. “ I think I overtook 6 to 8 people on that stretch but seeing as most of them would hide their race numbers I had no idea if I actually made the podium. I was pleased to find that I did.” In this final stretch, Christensen averaged a 3:43 km/mile, or 5:59 min/mile to finish the run in a new PR of 2:57:43 and final time of 9:09:48. In reviewing his complete run file two factors stick out. First is Christensen’s consistent pace through the entire marathon. Other than walking the aid stations, which was planned, his pace never wavers. His training focus on intensity over volume definitely worked. Second, it is notable that Christensen negative split the run by about 2 minutes. Looking at his Normalized Graded Pace (NGP), which takes into account elevation changes to say what your pace would be if the course were flat, his first 13.1 miles are at a 4:15min/km, or 6:50 min/mile pace and his last 13.1 miles are at 4:12 min/km, or 6:47 min/mile. Considering that the majority of the elevation changes occur in the last 13.1 miles, this is a very strong run. Going into the race Christensen had a well thought out plan. However, that plan was quickly altered and Christensen had to make some quick decisions. Smartly, he did not panic, dialed back his effort and waited until his body righted itself. His decision to hold back paid off, allowing him to run to his true capabilities. While he had a great result, Christensen is already thinking of the next season. He has set two big goals, “To win IRONMAN Frankfurt (I’ve finish 1st, 2nd and 4th the last 3 years) and give Maxwell (Levi Maxwell, the 25-29 age group winner) a run for the money in Kona.